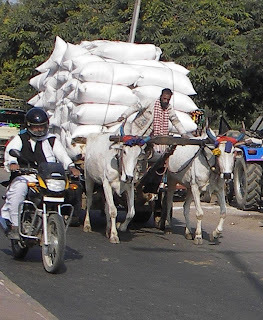 Transportation is complex in India. Part of it is due to the large population of 1.12 billion, and part of it is the mix between machine-powered, man-powered, and animal-powered vehicles that share the roads. Traffic signals are rare. I traveled mostly in the north, and during my 2 weeks there I did not see anything go over 40 mph. Just as well, because it would be incredibly dangerous without traffic lights, and the mad mix of machines and animals create way too many variables. 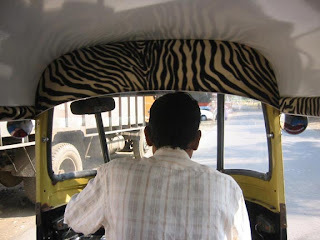 People honk their horns constantly in India, so it's extremely noisy to be out in the traffic. Here's a sample of Varanasi traffic. In Mumbai I traveled on foot, or by taxi. The taxis have a meter that moves very slowly in point decimals. One is supposed to multiply the number on the meter by 13 to know the fare in rupees. I did not know this, so the first few days I would ask the taxi driver how much before getting on the taxi. Most of the time it seemed reasonable, but one taxi driver did ask me for 200 rs for a 70 rs ride one time. He was an older man with no front teeth. Even though I knew he was asking way too much, I gave him the money because we were already at our destination. Afterwards I felt quite bad for about 20 minutes. It was my third day in India and thus far everyone had been extremely kind and genuine, and this was the first time someone was dishonest. But then I thought about his front teeth, and considered it a contribution to getting him some new teeth. After that incident, I would use the calculator option on my cell phone and multiply the meter by 13. This made some of the drivers shake their heads in disbelief, but I didn't know what else to do. I heard there was a subway system in Mumbai but I never got a chance to try it. After Mumbai I traveled many times on the train. The first thing I noticed about Indian trains was that they seemed three times as long the trains here in the States. When someone wants to go from one platform to the next, sometimes they cross the tracks instead of taking the overpass. This was the first time that I noticed how limber many Indians were. I saw a woman in her 60s cross the tracks in her sari. When she got to the other platform she put one foot up on the platform and hoisted herself up with one hand while holding her sari with the other, not something I would ever attempt without a 20 minute warm up session. There are at least 8 different kinds of ticket one can purchase for the rail train. They involved different variations on reserved, unreserved, AC, no AC, Sleeper, 2 Tier, 3 Tier etc. I saw how the non-reserved seating worked when I was on the platform, people just climbed on and tried to fit wherever they could. I decided early on to go with reserved seating only. 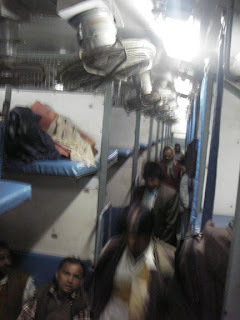 For long distances we usually got the 3 Tier AC, but once due to lack of availability we did rode in the Sleeper no AC. The AC cars are sealed, with doors on both sides of the car. The non-AC cars are not sealed, and there are no doors between the cars. This can be quite cold and windy at night in Northern India. Unlike the 3 Tier cars, Sleeper cars don't come with blankets. The non-AC cars have huge fans all along the ceiling. I have never experienced the extreme heat in India, but these fans told me enough. They don't announce the stations on trains, so one has to have a good psychic sense, which many Indians seem to have, or ask a neighboring passenger, or the conductor. The train can run quite late sometimes due to track work. 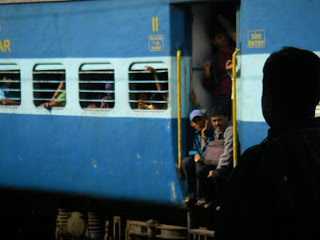 Our first overnight train was from Igatpuri to Gaya. It was supposed to be a 23 hour ride, but it turned out to be more like 29 or 30 hours. The people that shared the compartment with me were very nice. They taught me a singing game that is popular in India. One sings two phrases of a song, then the next person has to sing a song that starts with the last syllable. I listened to them for a while singing in Hindi, found out the rules, then suggested that I play also, but singing English songs. They found this suggestion amusing. My first turn was very lucky. Ha was the syllable so I sang Happy Birthday. Everyone was delighted and sang along with me. After I finished, they continued singing the second verse. What second verse?? May God Bless You . . . to the same music. I had never heard that second verse before. We continued many more rounds, with me singing mostly Christmas carols that I could recall so they could sing along. The fun part about the game, I decided, was having everyone sing along. But it was quite difficult at times because even though I remember tunes pretty quickly, I have never been good at remembering lyrics. When I got stuck sometimes, Hawley would bail me out, belting out some camps songs from the neighboring compartment. And when this didn't work, the others would say, tick tick one. . . . tick tick two. . . . and if you haven't been inspired by tick tick three, you lose your turn. Here I am pretending to sing along in Hindi. Once in a while, a guy would come through the car yelling Chai Chai, carrying a big metal Chai dispensor and tea bags and small paper cups. The Chai on the train was quite good. Another man would come and take orders for breakfast or lunch or dinner. The breakfast omelet made to order with hot pepper inside was so delicious that I ordered another. The dinner of curry vegetables was pre-made, kind of like airplane food, not as good. I could post an entire article about the bathrooms on the trains and the balancing and aiming skills required for success in these bathrooms. But since I have checked the Terms of Agreement box on this blog, I will not say more than this: if you are planning to go to India or to China even, you should practice squatting for 3 minutes at a time everyday the week before. 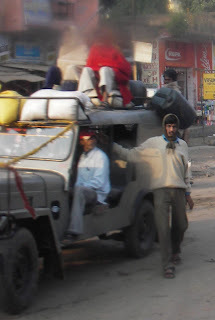 Auto rickshaw was the most common way we traveled locally. Always one had to haggle. Always they seem really put out that you are asking for the price that the station manager, or the bank teller, or anyone who is in the know tells you should be the price for this particular distance. At first we were really taken aback, gosh, every single auto rickshaw driver is trying to scam us because they always ask for a much higher fee. But once the fee is negotiated, it's done, and usually they become friendly and tell you a little about the drive through the city. Sometimes the drivers can be most informative, as was the case with our driver in Agra who told us about the different Mughal dynasties involved in the building of the Taj and the Red Fort. Haggling is part of the custom in India, and the customer is expected to do their part. One way to get the right price we found out, is to involve more than one rickshaw driver, and then whoever is willing to give the fair price first will get the fare. 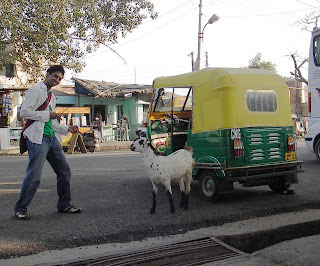 We found the drivers in Nasik to be the toughest negotiators, but that was before we had developed this technique. How many people are allowed in an auto rickshaw is a puzzle to me. 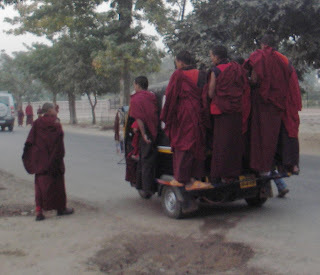 One driver refused to take more than three with our luggage. Actually three relatively slim adults can fit in the back, and one not so comfortably in the front with the driver. 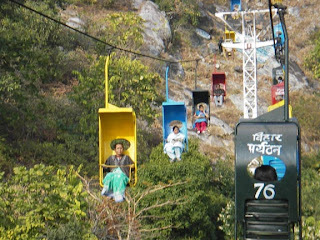 But I have also seen variations of riding the rickshaw and riding jeeps and trucks that involve riding on the exterior. 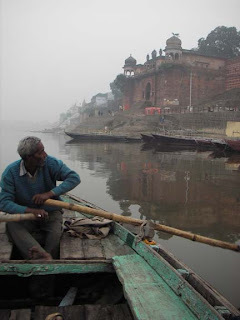 For our two hour tour on the Ganges river we hired a row boat and an English speaking guide. It was the best pace for seeing all the ghats, especially with the guide telling us a little history about each one. After about an hour, Hawley asked if the man rowing was tired, and that's where we first heard the saying, "Full power, 24 hour, no toilet, no shower, " meaning he was not in need of any breaks. 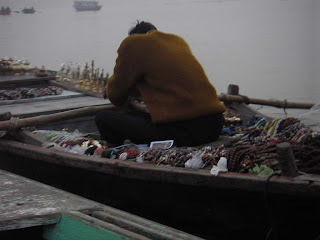 There were a lot of colorful boats on the Ganges. There was also one man in a boat visiting tourist boats selling all kinds of souvenirs. He said his was the moving grocery store. Even though cows are holy, I did see oxen pulled carts. For me, this picture gives new meaning to the phrase "strong as an ox". Other means of transport I saw include buses, pony carts, bikes, motor bikes, scooters, man-powered rickshaws, camels, cars, and trucks. 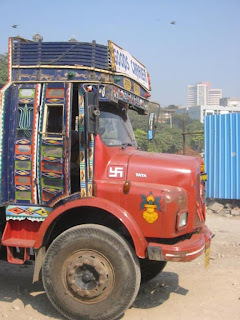 Indian trucks are very colorfully decorated in the front and often have messages written in the back like "Yes Please Honk."